Using flower essences in conjunction with astrology is a way of assuring that we use the energies represented by the planets in a way that empowers ourselves. The essences can help us to be responsible for our lives and to change problems into projects or difficulties into challenges. Alakananda and I researched and developed these formulas over a period of one year. The formulas were then used in our respective practices for several years before making them available to the public. The essences in this kit help create harmony with the issues represented by the symbols of astrology. You can use them individually or by combining them with other essences to create balance. Each essence can be used for either transiting or natal aspects. For instance, if you have Pluto transiting your second house, you may want to use a combination of Pluto Cycles and the 2nd House – 8th House Formula together. Another example is if you are experiencing a challenge with Pluto conjunct your sun in the second house of your natal chart. You may want to use a combination of Pluto Cycles, the Sun Formula and the 2nd House-8th House Fromula. An astrology chart contains so much potential for understanding ourselves that at times it can be confusing to know just where to start. 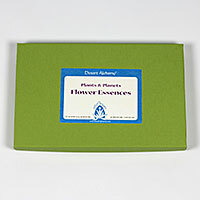 If you use an intuitive method for selecting flower essences, you can select essences from the Plants & Planets Kit to guide you in looking at a chart. They can help you to pinpoint areas that you might otherwise overlook. Another way to use these essences is to recognize transiting or natal aspects from your chart and then select the essences that can harmoniously integrate the opportunities represented by them. This kit contains 26 essences in 10 ml stock bottles. Each formula is also available separately. The houses represent the arenas or areas in which we play out our lives. These formulas can help create harmony in the respective areas. Rooting – Manifesting: our roots; relationship with home; that which helps us feel secure; outer manifestation; how the world recognizes us. Personal – Social Creativity: children; art; friends; groups. Awakening the Healer Within: our relationship to work; service; health and healing physically and spiritually; unconscious thoughts and patterns. These symbols represent the masculine and feminine or polarities within ourselves. The principle of assertiveness and self-affirmation; the drive for excellence; the desire for independence; the will to survive and to overcome obstacles and difficulties. These planets represent the transpersonal energies that show us the way beyond our personal perspective. the wounded healer, our deepest wound, how we facilitate healing for others. the principle of expansion, humor, overindulgence. death and rebirth; regeneration; transformation; transmutation; transitions. change; revolution; individuality; uniqueness; sudden insights. The asteroid formulas work with different aspects of the inner feminine. You can use the formulas to balance the issues connected to each archetype. the Earth Mother; nurturing; being grounded; how we nurture ourselves and others; our relationship to food; pregnancy; menstruation; birth; relationship between mother and child; woman's cycles; enmeshment; the ability and capacity to work. In astrology there is an understanding of the balance of the four elements from which our universe is composed. If we have an abundance or lack of planets in a particular sign, it may be balanced by using one or more of these formulas. intellectual; thought; inspiration; ideas; defining and communicating to yourself and others what you want; unlimited by form; infinite possibilities; the seed of a new form; letting go; flighty; ungrounded; nervous. form; structure; physical manifestation; slowness; holding on; building; grounded; the ability to manifest an idea; the ability to be steady and consistent; obstinate; rigid; obsessed. passion; conviction; the strength to survive; enthusiasm; faith; open to direction from your higher power; knowing the source; spirit; burned out; intense; don't know when to stop. receptive; feelings; compassion; allowing feels to flow; no shape of your own; holding onto emotions; taking on feelings or emotions of others. a point in the astrology chart that represents the center of our galaxy; presently at about 27° Sagittarius; how we are a mouthpiece for universal energy; the method through which we manifest our higher purpose. the Earth Mother; nurturing; being grounded; how we nurture ourselves and others; our relationship to food; pregnancy; menstruation; birth; relationship between mother and child; woman’s cycles; enmeshment; the ability and capacity to work.